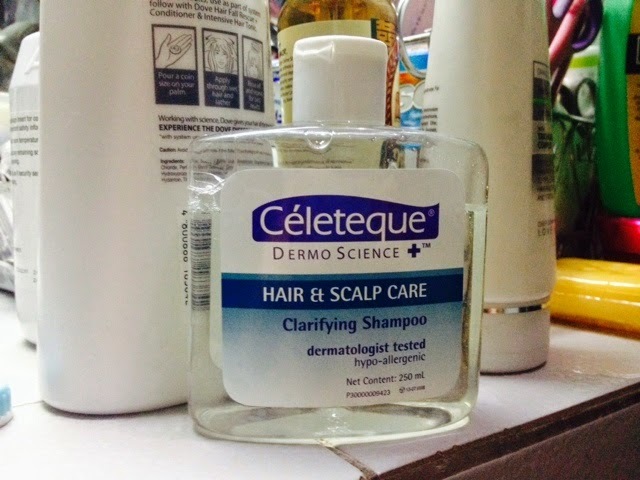 Celeteque Hair & Scalp Care Clarifying Shampoo | Vanity and Everything in Between. Another hair care post. On a roll, aye? Just a coincidence, love. A few months ago, while I was going around SM department store, I chanced upon this new product of Celeteque. I didn't know they have a shampoo. When I asked the saleslady, she said the shampoo arrived about a week ago. The saleslady said it's ought to clean your hair the way most shampoos can't, so I decided to try this. It does not have a conditioner to pair with so I was kinda worried about that. How did this shampoo fare? I tried it the following day. The first thing I did was smell it. I wanted to have an idea how my hair would smell like. It smells gentle it actually reminds me of a baby shampoo. The instruction said to only use this once a week. I think if you use it too much, your hair will become dry and maybe brittle. Also, you can't use a conditioner with this. You just can't. I was surprised upon first use! You see, I was expecting my hair to be tangled and difficult to comb as it is always the case when I don't use conditioner. But no, no, no. My hair felt soft and silky. I knew my hair was clean because it doesn't feel oily. You know what feeling when you've put too much conditioner or mousse on your hair? That feeling. I don't use hair spray on a daily basis but when I used this to rinse off my hair from tantamount hair spray, my hair felt fresh like I didn't use hair spray the day before. I only use this once a week usually every Saturday. On weeks where I'm spend more time outdoors, I use this twice a week. I won't even attempt to use this daily as I don't want to damage my hair even more. For its price of PhP200.00, I'd say it's worth it. After all, you're only going to use this once or twice a week. One bottle could probably last you one year! I've had this since February or March and I've only use up that much. I definitely recommend this if you want to give your hair some TLC without spending so much. I purchased mine at SM department store. This is also available at the grocery and other department stores but it is sold at a higher price (around PhP213.00 if I remember correctly). Have you tried this one yet? Let me know if the shampoo works for you! Will this work for dandruff also? True. Super galing sya. I bought mine at Watsons. Goodbye frizzy hair na ko. I have curly hair kasi, before ang hirap talga i-comb so Ive tried this. It Works like magic.